The book of Joshua has come under intense scrutiny in recent years as part of the maximalist-minimalist debate in biblical archaeology. While one might assume that maximalists would argue against minimalists for the validity of the biblical record where external corroboration can be found with respect to many aspects of the history of ancient Israel, neither side is in fact supportive of the biblical record as fact. This is particularly true of the account of the conquest of Canaan by the Israelite tribes under Joshua’s leadership. Just what does the Bible tell us about that period, and can it be trusted? As the book of Joshua opens, Israel’s great leader, Moses, has just died and in his stead God has appointed his assistant, Joshua. What follows covers the remaining 26 years or so of Joshua’s life. Of the book’s 24 chapters, the first 12 describe the capture of the land. The second half deals mostly with the apportioning of the territory to the various tribes of Israel. The closing three chapters record an early threat of strife among them and the final words of Joshua. It is appropriate that the second major section of the Hebrew Bible, “the Prophets,” should begin with Joshua, because the book extends Israelite history into the era of the men God sent to prophesy to His people and to the nations around. This second division of Hebrew Scripture comprises the Former and the Latter Prophets. The lengthy block of content covers several centuries from Israel’s arrival and gradual possession of the Promised Land to their removal into captivity for sin and the eventual return of some of the tribes during the time of the post-exilic prophets. The order of the books of the Hebrew Scriptures, as Christ would have known them, was according to the tripartite division: the Law, the Prophets, the Writings. The Law includes the five books of the Pentateuch (Genesis, Exodus, Leviticus, Numbers, Deuteronomy). The Prophets comprises the Former Prophets (Joshua, Judges, 1 and 2 Samuel [counted as one book], 1 and 2 Kings [counted as one book]) and the Latter Prophets (Isaiah, Jeremiah, Ezekiel, the Twelve Minor Prophets [counted as one book]). The Writings consists of Psalms, Proverbs, Job, the Song of Songs, Ruth, Lamentations, Ecclesiastes, Esther, Daniel, Ezra-Nehemiah (counted as one book), 1 and 2 Chronicles (counted as one book)—24 books in total. In recognizing Joshua’s new role, God told him to now take possession of the land He had promised to the patriarchs, Abraham, Isaac and Jacob. Joshua was to “be strong and very courageous” in leading the people across the River Jordan to seize territory from seven independent Canaanite peoples (Joshua 1:2–4, 6–7, 10; 24:11). Confirming His support, God also said, “No man shall be able to stand before you all the days of your life; as I was with Moses, so I will be with you. I will not leave you nor forsake you” (Joshua 1:5). Moses was recognized as a prophet (Deuteronomy 18:18), and Joshua, though not named as such, surely fulfilled the role of one who delivered God’s Word to the people (see Joshua 3:9). First, Joshua sent two spies across the river to reconnoiter the nearby ancient city of Jericho. There they met an innkeeper and/or prostitute, Rahab, who sheltered them once she knew who they were. The townspeople had heard of the coming of the Israelites, how God had opened the sea during their exodus from Egypt, and how they had defeated two kings on the east of the Jordan and taken their land, giving it to the tribes of Reuben and Gad, and half the tribe of Manasseh. This news had filled them with fear. Capitalizing on her meeting with the spies, Rahab asked that she and her family be protected in any attack on Jericho. They agreed, and she advised them that in order to evade capture, they should descend over the city wall by night, using a red rope, and hide in the nearby mountains for three days before returning to their camp. This allowed the spies to arrive safely on the east side of the Jordan and report back to Joshua that the land could be taken because Jericho’s inhabitants were afraid (chapter 2). When the time came to traverse the Jordan, the priests were to carry the ark of “the Lord of all the earth”/“the covenant”/“the Testimony” a short distance ahead of the people. This signified appropriate separation from God’s holiness and also that He would be central to their future. As the priests’ feet touched the swollen springtime waters, the river was stopped several miles upstream and the people crossed over, the priests standing on dry ground in the midst of the river till everyone reached the opposite bank (chapter 3). Two memorials, each made up of 12 stones from the Jordan, were set up to remind Israel that God had delivered them once more by great intervention. One memorial was at Gilgal on the river’s western bank (to become Israel’s temporary headquarters), and the other was in the river where the priests’ feet had stood (4:1–9, 19–20). Forty thousand of the people were now available for battle against the Canaanite population (verses 12–13). But first God commanded that the males be circumcised as their fathers had been in Egypt. Those men had died in the 40-year wilderness wandering, and younger males born since that time had not been circumcised, so it was time to correct the situation (5:2–9). This accomplished, the Israelites kept the Passover in the plains of Jericho, eating grain from the new land as well as unleavened cakes. At this point the miraculous manna, which God had supplied in lieu of bread, ceased (verse 12). As encouragement to proceed to Jericho, an angel—identified as the commander of God’s army—came to Joshua to assure him of victory (verses 13–15). Now the warriors could focus on capturing the city that had by this time been closed up by the fearful inhabitants. This was achieved by marching around the city each day for six days and on the seventh making a sevenfold circuit. On each circuit the men of war marched in front of the priests, who blew ram’s horns, followed in procession by the ark and the people. Each day they returned to their camp and rested. At the seventh circuit on the seventh day, the rams’ horns sounded and Joshua ordered the people to shout loudly. The walls then miraculously fell down, leaving the way open for the Israelites to plunder the city and kill its citizens (6:1–16, 20–21). As prearranged, Rahab and her family had tied the spies’ red rope in their window to ensure protection when the city was attacked (2:18; 6:22–23). Joshua had warned the people against taking the spoils of war under penalty of a curse. But one man did and brought Israel into great danger: Achan stole a beautiful garment, a wedge of gold, and silver coins (7:20–21). This act of disobedience resulted in Israel’s defeat by the people of an adjacent town, Ai. Only when Achan’s sin was uncovered and dealt with could Ai be captured (8:1–29). Moses had given a command that when the Israelites came to the land they should assemble before two mountains in the center of the country to receive God’s blessing. Joshua followed these instructions and asked for that blessing on Mt. Gerizim and Mt. Ebal, building an altar and copying out the law on the stones. He also reminded the people of the blessings and cursings for obedience and disobedience to God’s law (verses 30–35). The outcome of Joshua’s success at Jericho and Ai brought six of the seven indigenous peoples together against Israel, with the additional exception of the inhabitants of one city; the people from Gibeon took a different approach to the word of Israel’s dramatic victories. They decided to attempt to deceive the Israelites into making a peace treaty with them, thus avoiding any potential defeat in battle. Pretending to be ambassadors from a far country, they wore old clothes and carried old sacks, moldy bread and torn wineskins on their donkeys. Parrying Joshua’s question as to whether they were in fact local people, they replied that they were Israel’s servants from afar and that their elders and countrymen had heard of the fame of Israel’s God in defeating the kings on the east side of the Jordan and the cities of Jericho and Ai (9:1–13). Foolishly, and without seeking God’s counsel, Joshua and the Israelites asked no further questions and made a treaty of peace with them. Three days later, when the truth came out, the people of Israel complained against their rulers. But Israel’s leaders had to honor their commitment to the Gibeonites. As a result, Joshua “delivered them out of the hand of the children of Israel, so that they did not kill them. And that day Joshua made them woodcutters and water carriers for the congregation and for the altar of the Lord, in the place which He would choose, even to this day” (verses 26–27). The news of Gibeon’s submission to Israel put such great fear into the king of Jerusalem, Adoni-Zedek, that he formed an alliance with neighboring kings to attack Gibeon. With their treaty in place, the Gibeonites called on their new ally, Israel, to come and protect them. Joshua was thus able to defeat the coalition of local peoples, helped by a sudden great hailstorm that killed more than the battle itself had (10:1–11). Is there any evidence that before the seventh century the Israelites knew of the events Joshua recorded? An additional remarkable event happened that day. Joshua asked God that daylight be lengthened so that the Israelites could extend the rout. According to Joshua, the ancient but no longer extant book of Jasher also records this event, noting that “the sun stood still in the midst of heaven, and did not hasten to go down for about a whole day.” The book of Joshua continues, “And there has been no day like that, before it or after it, that the Lord heeded the voice of a man; for the Lord fought for Israel” (verses 13–14). Five of the attacking kings found refuge in a cave, only to be imprisoned there by the Israelites. At the end of the long day, Joshua had the kings executed. This gave the Israelites the advantage, and they wasted no time in moving against the territory of these kings in the southland: “So Joshua conquered all the land: the mountain country and the South and the lowland and the wilderness slopes, and all their kings; he left none remaining, but utterly destroyed all that breathed, as the Lord God of Israel had commanded” (verses 40–43). The war was then extended to the north where Joshua had similar success. All of this took much time. The language here speaks of an all-encompassing destruction of the southern Canaanite peoples. We read further, “So Joshua took the whole land, according to all that the Lord had said to Moses; and Joshua gave it as an inheritance to Israel according to their divisions by their tribes. Then the land rested from war” (11:23). Yet in specific places where Joshua is said to have conquered and completely removed the people (see 10:38–40), various tribes remained. We read that the Israelites had to continue to drive out the local tribes (see 15:63; 16:10; 17:12–13; 19:47). Despite Joshua’s victory over “the whole land,” including the Anakim tribe of giants that the Israelites had so feared and whom Joshua “utterly destroyed” (11:21–22), they were still a force to be driven out later by his fellow wilderness spy, Caleb (14:12). We see this again in the opening verses of the book of Judges: “And afterward the children of Judah went down to fight against the Canaanites who dwelt in the mountains, in the South, and in the lowland. Then Judah went against the Canaanites who dwelt in Hebron. (Now the name of Hebron was formerly Kirjath Arba.) And they killed Sheshai, Ahiman, and Talmai [all members of the Anakim; see Numbers 13:22]. From there they went against the inhabitants of Debir. (The name of Debir was formerly Kirjath Sepher)” (Judges 1:9–11). 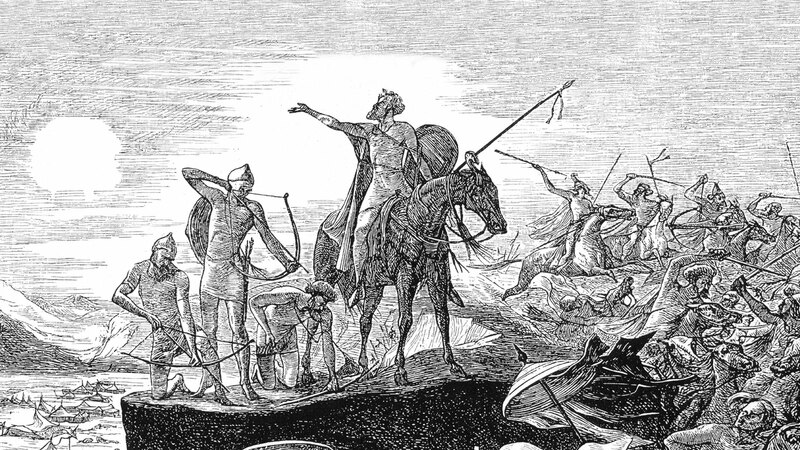 This apparent contradiction between what Joshua is said to have accomplished so thoroughly and what yet remained to be done suggests that the language of the book of Joshua is idealized to reflect Israel’s broad success in overthrowing the Canaanite kingdoms rather than their complete extermination of those kingdoms. Most of the second part of Joshua is given over to describing the boundaries of the land distributed among the nine and a half tribes of Israel on the western side of the River Jordan. The tribes of Reuben and Gad and half the tribe of Manasseh had already received their shares on the eastern side during Moses’ lifetime (see 13:15–32). Now the remaining tribes received their allotments, with the exception of the Levites who were to live among all the tribes in 48 specific cities, but without inherited land (14:3–4; 21:1–42). Judah received a large portion of land to the south (Benjamin would receive Jerusalem and nearby cities but would be unable to hold on to the Jebusite city against its inhabitants). The two sons of Joseph, Ephraim and Manasseh (the other half of the tribe), were given territory in the center north and west. For the rest, Joshua cast lots according to a survey drawn up by appointed officials who divided the land into seven portions (18:2–6). This process occurred in Shiloh in central Israel, where Joshua had permanently set up the tabernacle or principal place of worship. The order of the lots as they were taken was Benjamin, Simeon, Zebulun, Issachar, Asher, Naphtali and Dan (18:11–19:48). Joshua himself was granted a special portion of land in Ephraim, his tribal affiliation. The Israelite leaders also organized the creation of cities of refuge for protection from revenge against any who had accidentally caused the death of a fellow countryman (chapter 20). In one of the closing chapters of Joshua, we read of an altar that was constructed by the trans-Jordanian Israelite tribes on the border. Threatened by the other tribes with war over what they perceived to be idolatry, the tribes came to an understanding; they would be united in not displeasing God by even appearing to worship other gods (chapter 22). Joshua was by now very old, and recognizing his duty to give final words to the people, he reassured them that God would provide the help needed to complete the removal of the Canaanites: “The Lord your God will expel them from before you and drive them out of your sight. So you shall possess their land, as the Lord your God promised you. Therefore be very courageous to keep and to do all that is written in the Book of the Law of Moses, lest you turn aside from it to the right hand or to the left” (23:5–6). If they would not be vigilant to keep themselves separate from the surrounding peoples and worship only Yahweh, but instead intermarry and take on pagan practices, then they would suffer the consequences: “Know for certain that the Lord your God will no longer drive out these nations from before you. But they shall be snares and traps to you, and scourges on your sides and thorns in your eyes, until you perish from this good land which the Lord your God has given you” (verse 13). Calling the people and the elders together at Shechem, Joshua gave his final address, quoting God as reminding them of their forefather Terah’s journey out of Mesopotamia, where he had served pagan gods. He drew their attention to Abraham’s calling, to the birth of Isaac, Esau and Jacob, to Israel’s deliverance from Egyptian slavery and the wilderness years, and now to their possession of the Promised Land (24:1–13). “Now therefore, fear the Lord, serve Him in sincerity and in truth, and put away the gods which your fathers served on the other side of the River and in Egypt. Serve the Lord!” (verse 14). If they would do this, their success would be guaranteed. And the people did agree to do so several times (verses 16, 21, 24). Joshua then made a covenant with the people, making it a statute in Shechem and writing it in a book of the law that he set up under an oak by the sanctuary at Shiloh. Joshua died at 110 years of age; he was buried in Mount Ephraim and was respected highly by the people, who remained faithful during the lifetime of the elders who had known him (verses 25–27, 29–31). A postscript tells us that the bones of Jacob’s son Joseph, which had been carried up from Egypt, were buried in Shechem, on the land purchased by Jacob as a grave for his wife (Joseph’s mother) Rachel. In the same region in the territory of Joseph, the son of Aaron was buried in Mount Ephraim. The next book in the Former Prophets, Judges, continues the history of Israel following Joshua’s death and will be covered in the next installment of The Law, the Prophets and the Writings. Roger T. Beckwith, The Old Testament Canon of the New Testament Church (1985). Trent C. Butler, Word Biblical Commentary, Vol. 7, “Joshua” (1984). Arnold G. Fruchtenbaum, Ariel’s Bible Commentary: The Books of Judges and Ruth (2007). James K. Hoffmeier, Ancient Israel in Sinai: The Evidence for the Authenticity of the Wilderness Tradition (2005). Kenneth A. Kitchen, On the Reliability of the Old Testament (2003). 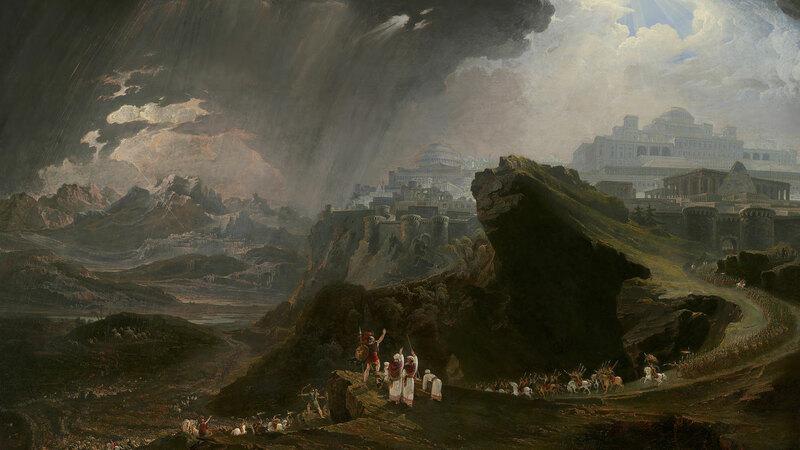 “John M. Monson, “Enter Joshua: The ‘Mother of Current Debates’ in Biblical Archaeology” in Do Historical Matters Matter to Faith? (edited by James K. Hoffmeier and Dennis R. Magary, 2012).